If you haven't noticed from my Instagram feed, I travel a lot. Like a lot, a lot. We've been around the world a few times - Korea 3x (check this hashtag for the first trip & this hashtag for the second), Japan, Amsterdam (yay for Hema!) - and we've traveled home quite often. Being that I moved 800 miles away from my family I like to go home as much as I am able. the 10 ml glass bottles & spray tops were sent to me by Got Oil Supplies, all opinions are my own. Maintaining routine when traveling is very important. We can get thrown off our rhythm and distracted from any self care rituals we've set put. We can find it hard to sleep in new environments and have trouble adjusting to a hotel room, a new city, or even being back in our childhood bedroom so keeping things close to us that provide comfort is a must. For me, that includes my essential oils. These guys give me a sense of peace & a sense of normalcy. Not to mention some of them outright replace a few things I used to carry with me. So lets get to the recipes. For each of these recipes we'll be using some sort of carrier. I use that term loosely here because usually you'd use something like Fractionated Coconut oil to carry the oils - dilute them properly for topical application. But for some of these we'll just be spraying them on clothes or a pillow and not necessarily the skin so there's not really a need for FCO in each recipe. This is like instant lights out! So if you have trouble sleeping especially while away this may give you some peace of mind. In the spray bottle combine 5 drops Lavender, 3 drops Cedarwood, and 3 drops Vetiver. Lavender is great for calming while both Cedarwood and Vetiver are grounding. I swear, for me, any thing with Vetever is so soothing to me! Top the spray bottle off with water. Shake before you spray your pillow then nod off to sleep! Stuff can get stinky if we've been traveling - especially in the summer - so a little deodorizer & fabric refresher can be much needed. 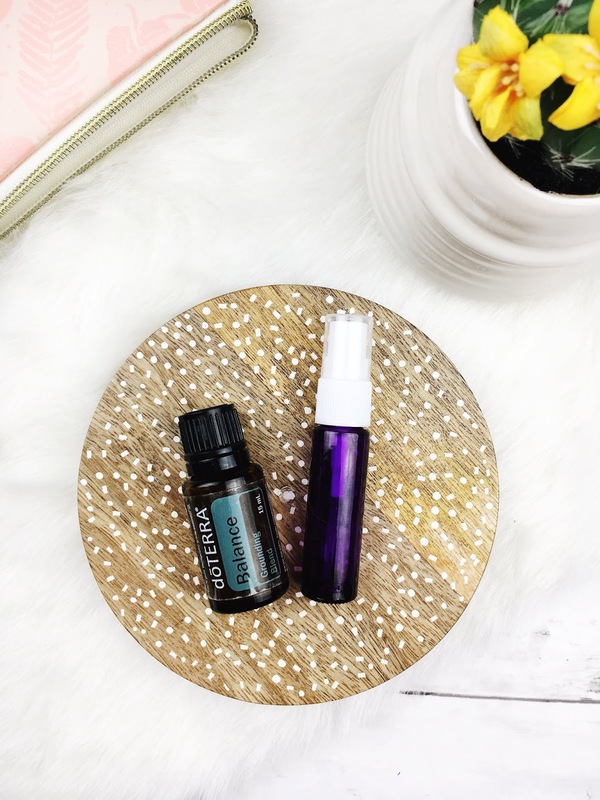 Combine 5 drops Purify blend & 5 drops Melaleuca in a spray bottle. Top with water if you're going to be using on your clothes or use witch hazel if you've like to try for a natural deodorant. I have yet to find something that helps me not stink but these oils work great for me on fabrics. Spray a bit on the fabrics and let them air out. 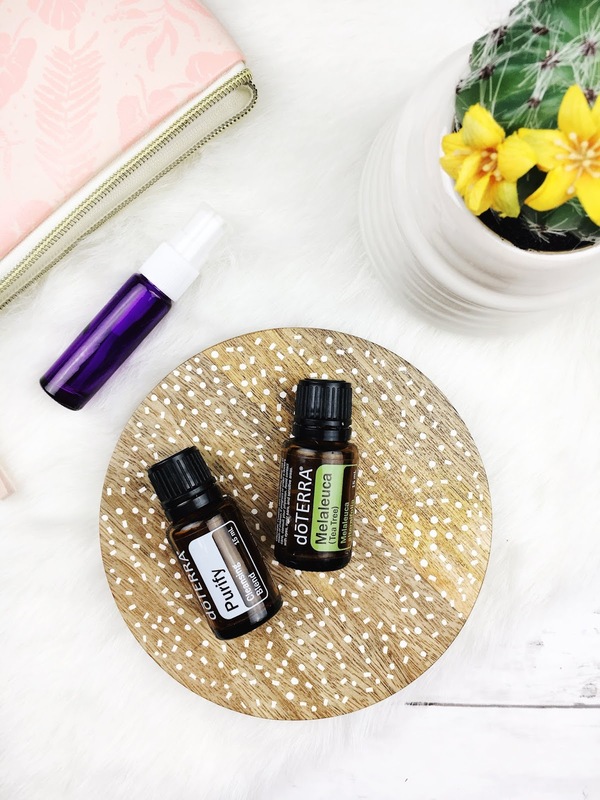 Both of these oils have purifying & cleansing chemical properties. 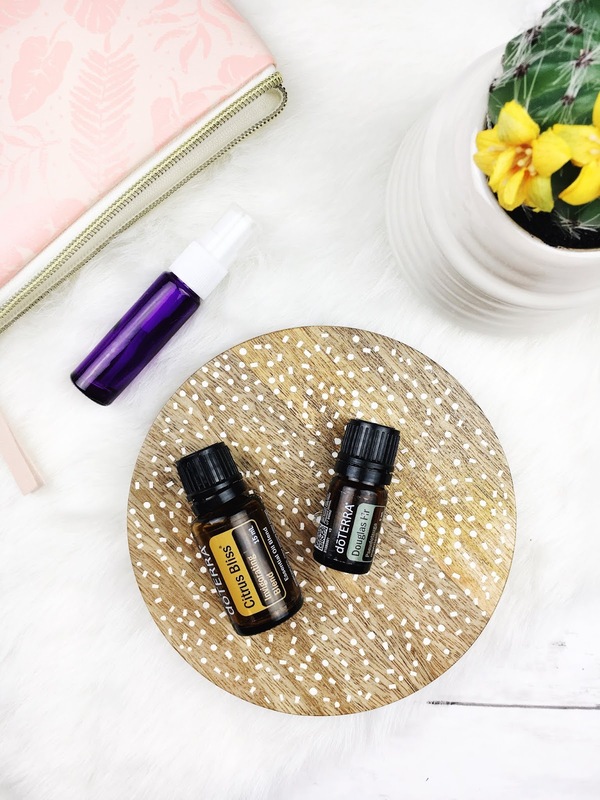 My two ultimate feel good, get your happy on oils are Douglas Fir & Citrus Bliss. This is literally happiness in a bottle! Combine 5 drops Douglas Fir & 5 drops Citrus Bliss in a spray bottle and top with water. Spray on anything & everything, any time you need it. Make sure to avoid skin if you'll be outside as citrus oils are UV reactive. But seriously, go ham with this blend! This is a blend I used recently on my summer vacation & I have something else to add to it - witch hazel. Witch hazel is great for the skin and when you add in other skin loving oils like Melaleuca & Lavender you've got a wining combination. 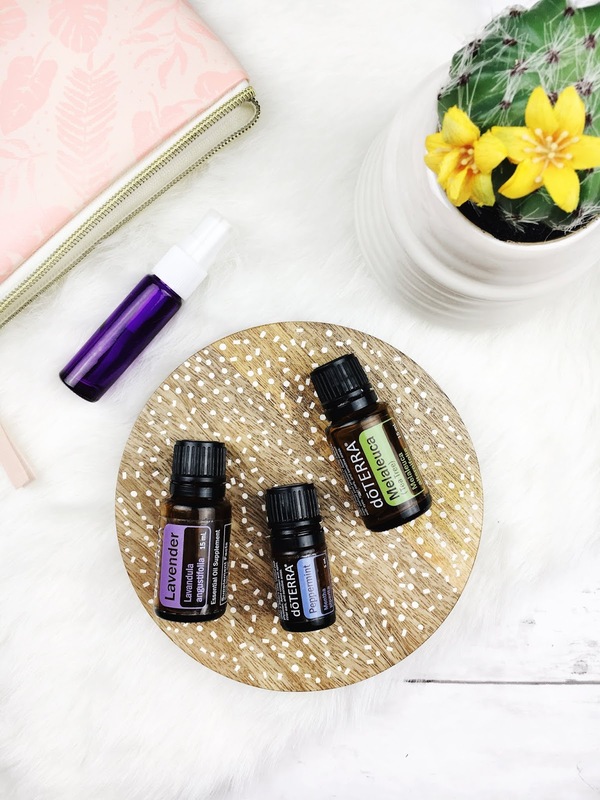 Combine 5 drops Lavender, 5 drops Melaleuca, 1 drop Peppermint (you can do more, I just find Peppermint to be very strong) in a spray bottle. Top with equal parts Fractionated Coconut Oil & witch hazel. You can either spray right onto the skin or spray on a cotton round and apply. Applying with a cotton round is easier for the face especially if you've gotten a bit too much sun other wise just do a few quick sprays to cool off. 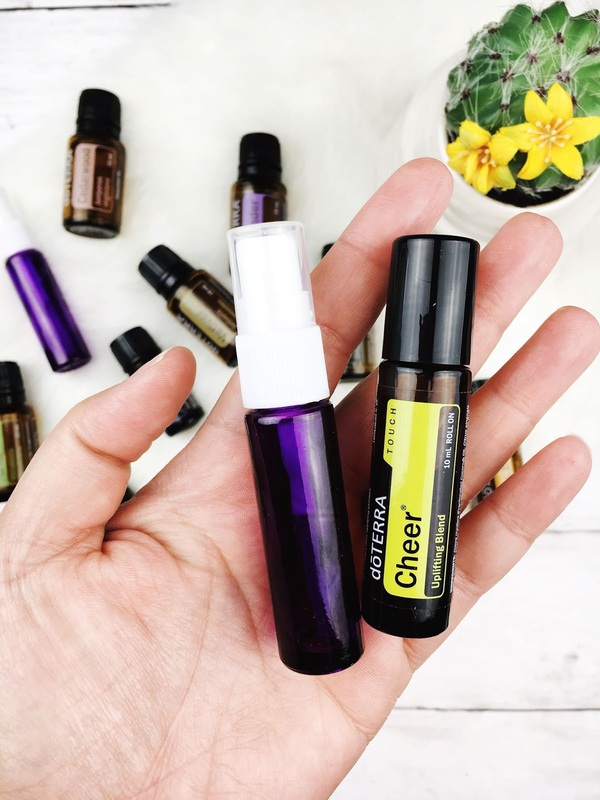 Balance is an oil that I wish was in a roller bottle, a spray bottle....heck I wish I could get a 50 oz bottle of this stuff! For me this is my zen oil. Whenever I need a break or I need to really relax I bust this baby out. Combine 10 drops with water in a spray bottle and spray on your clothes, etc when you need to just relax. 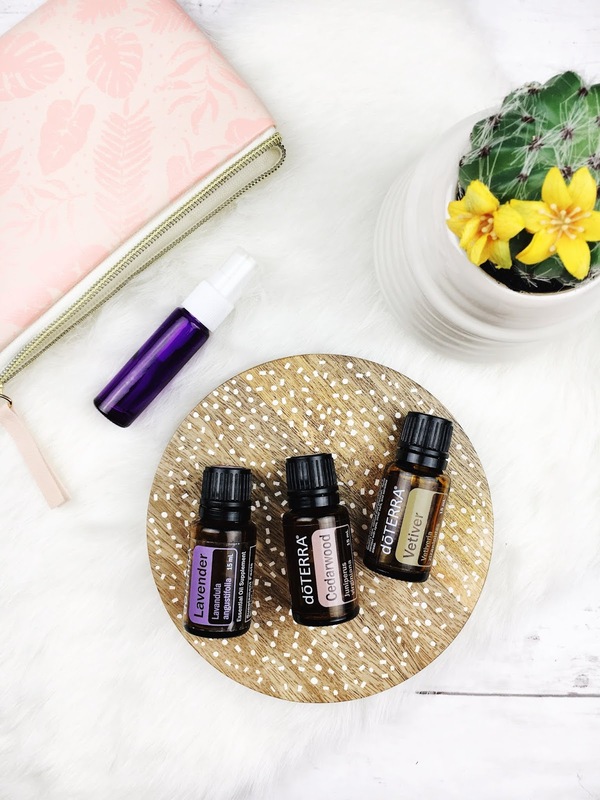 This is a perfect way for me to travel with this oil when I need it quickly. It really helps me sink into a meditative head space easily. 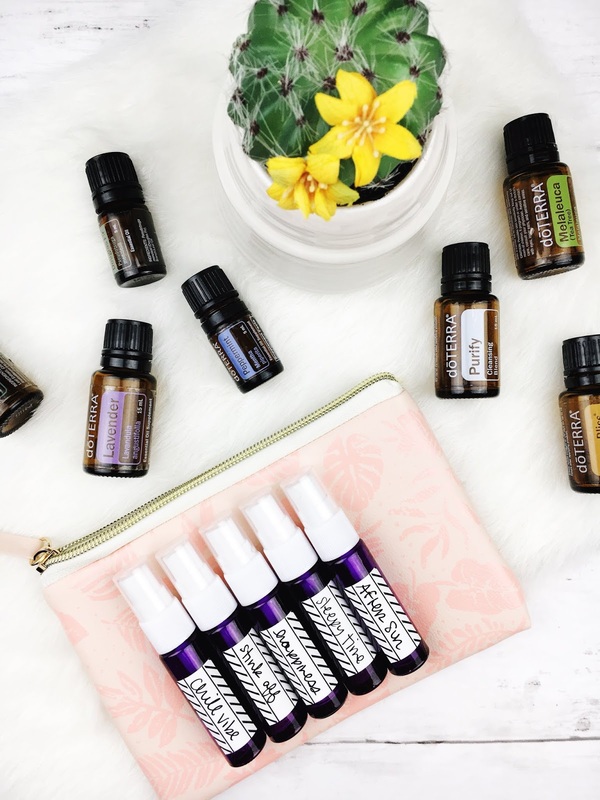 If you hadn't noticed all of these blends use some of the top 10 oils for travel. 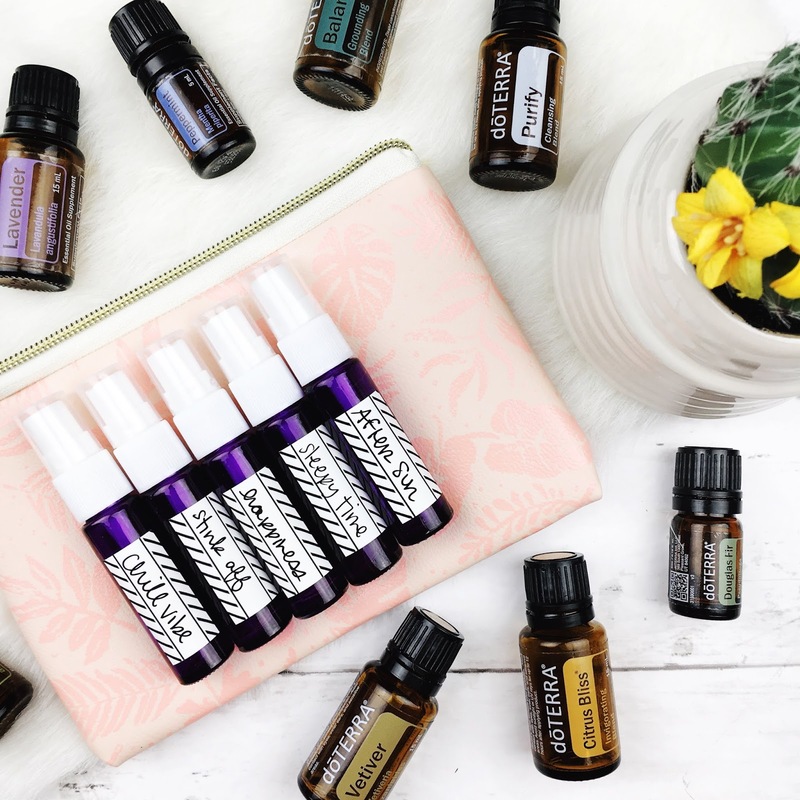 The problem with traveling with a ton of oils means the blends you're gonna make - in your hand, on your pillow, or in your travel diffuser - take up space because you've got to bring them all! The slim profile of these spray bottles from Got Oil Supplies means they won't take up too much space. In fact, they will only take up as much space as your roller bottles. Love it! These guys will slip easily into a small make up pouch or pencil case (hello Target Dollar Spot #amirite) so they won't take up space in your bag. 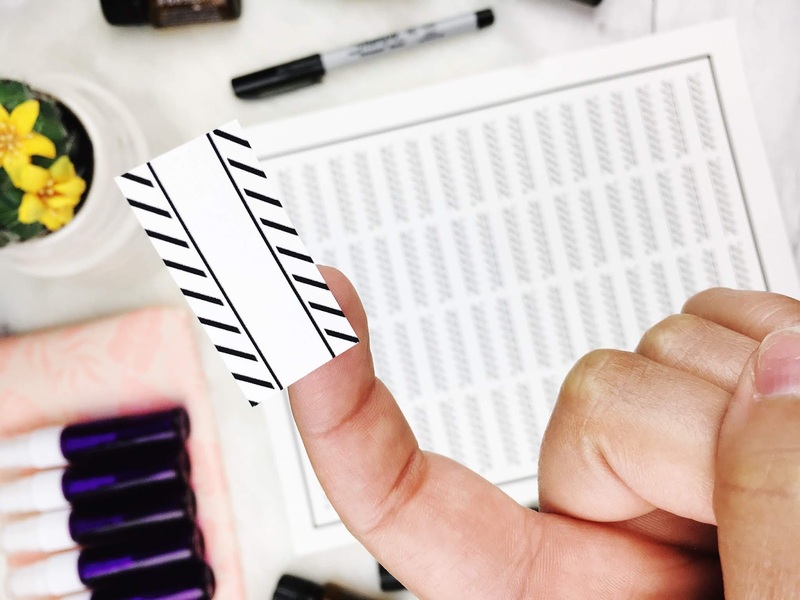 I've even got some labels for you to print at home and cut by hand or with your Cricut or Silhouette machine. These guys fit perfect on the bottle - the are 1.5 inches wide by .75 inches tall and have a space to write your own blend names in permanent marker. When you upload the PNG to Cricut Design Space be sure to erase the branding strop at the bottom & size it to 6.75 x 9.25 inches. I also suggest this waterproof paper from Online Labels to print these guys on. use 516LOVE over on Got Oil Supplies for 10% off your order! 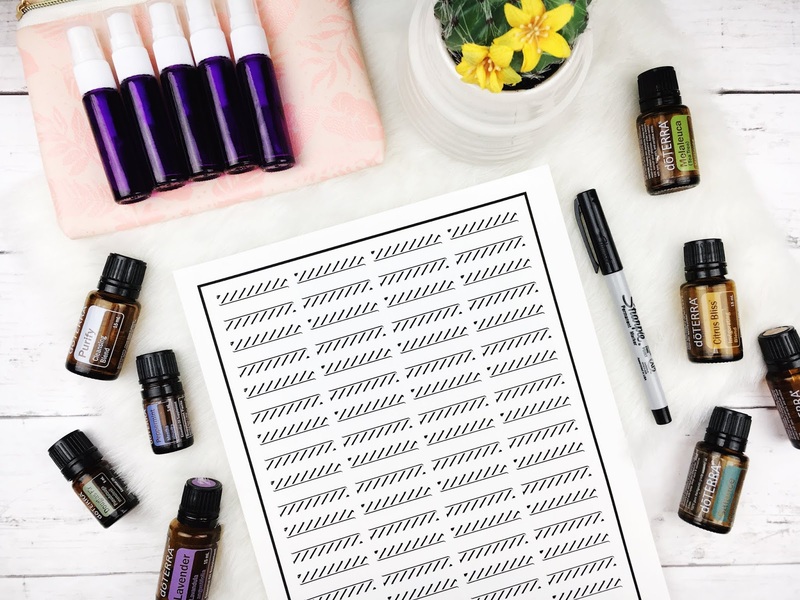 There's a ton of quality supplies, containers, etc for your essential oil blending, storing, and sharing needs. I especially love these purple glass bottles that were sent to me for this project because purple is my favorite color! It is always nice to be inspired by your collections - sometimes plain old amber bottles just don't do it for me. What are your favorite blends? What are you going to pick out from Got Oil Supplies? Let me know in the comments!